This sphere, which was begun on 4 March 1588, is of unusually large dimensions. It is made up of a gilded wooden armature, which is supported on a base, also gilded, with four mermaids. The armature is made up of the principal meridian circle, on the plane of which the colures of the solstices of the spheres can be seen, of the horizon, through the grooves of which the meridian passes, and of a system of arcs placed on the brackets at the height of the horizon, which holds up the zenith. This, in turn, bears a gilded sphere surmounted by a cross, underneath which is a disc on which God the Father is painted. At the centre of the sphere is the Earth, represented by a vividly coloured globe. The Earth is surrounded by the seven planetary heavens (in the order: Moon, Mercury, Venus, Sun, Mars, Jupiter, Saturn), each consisting of a ring of gilded and painted wood. These are followed by the eighth heaven of the fixed stars, with the wide band of the zodiac, and the ninth heaven, known as the Primum Mobile, which bears the polar caps (on which the Medici-Lorraine arms are painted) and the meridians, in metal wire. Inside the armature are 24 wooden circles, numbered with Roman numerals, perhaps corresponding to the 'Houses of the planets', for an astrological usage of the sphere. The axis of the world penetrates the sphere. It terminates at the upper end with a dial displaying the diurnal motion of the axis itself. The lower part terminates in a hole in which a handle was inserted, allowing the mobile heavens to be rotated in accordance with the Ptolemaic-Aristotelian system. The sphere was commissioned from Antonio Santucci, 'maestro di sfera', by Ferdinando I de' Medici. It was completed on 6 May 1593, and cost 1222,2 scudi. Painters, gilders and mechanical workers collaborated in its construction, under the direction of Santucci himself. 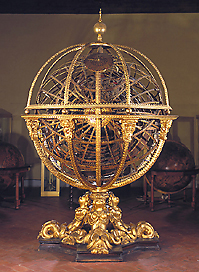 The sphere was placed in the mathematical room of the Gallery of the Uffizi, from which it was transferred in 1775, into the courtyard of the Museo di Fisica e Storia Naturale, founded by Grand Duke Pietro Leopoldo. It was reduced to extremely poor condition until its restoration in 1876 by Ferdinando Meucci, director of the Museo. See F. Meucci, La sfera armillare di Tolomeo (Florence, 1876); M. L. Bonelli (ed. ), Catalogo degli strumenti del Museo di Storia della Scienza, Firenze, (Florence, 1954), pp. 47-9; and M. Miniati, Museo di Storia della scienza: Catalogo (Florence, 1991), pp. 102-4.